Hello everyone, how are you? Today, I wanted to share with you my new face cares routine. In case, you are new to my blog I wanted to welcome you and say that I have dry face. As you all know, during the winter time dry skin starts to be more dryer. A while ago, I've reviewed the Mixas cleaning gel, cleaner milk, dd and cc cream. The reason why I've decided to change it up, before I have used to all Mixa's product and I must go in search for new routine and products. 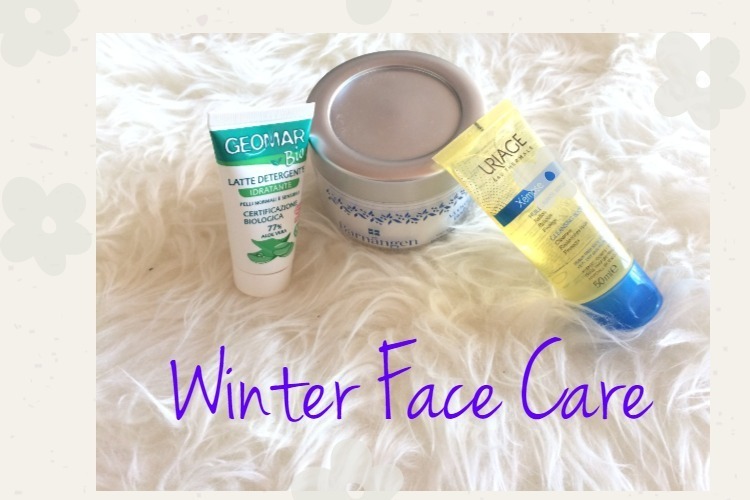 In my Tester beauty box of December I got products that work perfect together for my skin. It has surprise me so much because I didn't have high hopes at all. For a while now, I was looking for cleansing oil for my face and I got one from the brand Uriage Xemoseis. What I love the most is that you can use it for cleansing your body too. The people who travel a lot that is ideal product. You have two products in one and a really small amount is enough for a hole face. I haven't found nothing negative about the product. My skin is sensitive too and I didn't experience any redness or itchiness I must say I was impressed. For taking out my makeup nowadays I use Geomar cleaning milk who has 77 % of Aloe Vera. This is an Italian brand. The smell of the product is nice and it's not strong at all it is a very pleasant smell. This product has Eco certificate, Veganok and cosmos organic and I love that. Product texture is very light consistency. The most shocking product is my moisturizing cream. I got this product in my first Tester beauty box and when I read that is from head to toe I was like OK. The products name is Barnängen All Over Rescue Body Balm and the texture is really thick, I must say I was a bit scared for a moment but I need a good winter cream, especially this winter when my skin acts the most crazy. In case, you have a dry and sensitive skin like me, you need to try this combination. Tell me in the comments below what type of skin do you have?